Odd night, apparently. 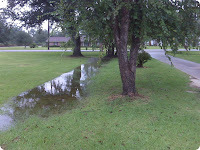 I don't recall hearing any torrential downpours. Seemed like a normal night. And then the day breaks to reveal the depths of my apparent ignorance. On the way to work, the beach held some surprises for me. It looks like Fay did a number on Highway 90. 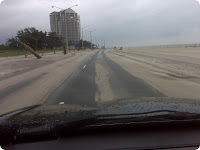 A good portion of the beach covered the road. Some of the areas still had large stretches of standing water.It wasn't a dire situation, but I still kept both hands on the wheel. And kept a safe distance from other cars. All in all, I think I slept through the worst of the storm. And life won't be any different after Fay.